Legislation that will pave the way for the introduction of abortion in Ireland will be brought to the Dáil in a matter of weeks. However, Minister for Health Simon Harris has warned against reopening the referendum debate after former Taoiseach John Bruton said the proposed legislation needs to be amended. Mr Harris confirmed today that the Bill is being finalised. Yesterday, the Supreme Court refused to hear a further appeal by a Dublin woman who wanted to challenge the result of the referendum repealing the Eighth Amendment. 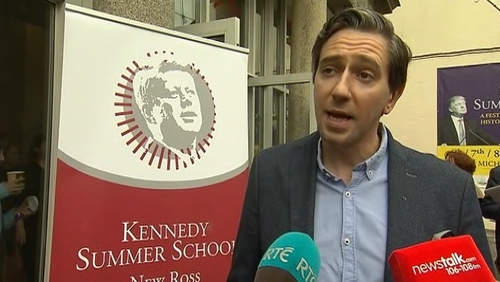 Speaking at the Kennedy Summer School in Co Wexford today, Mr Harris welcomed the fact that the legal challenge has been dealt with by the courts and said he hopes to introduce the bill into the Dáil in October and have new services in place from January of next year. Mr Harris said that members of the Dáil and Seanad have a role to debate the issues on his legislation to affect the result of the referendum, however he said "lets's not try to recommence a campaign here or re-begin the debate". He said he published a detailed general scheme of that bill in advance of the referendum so that people knew exactly what they were voting on and he now has a mandate for that legislation and there is a responsibility on him not to deviate from it. The Minister's comments come as former Fine Gael taoiseach John Bruton has called for amendments to the proposed bill, which he said must be "pursued with vigour". He said that the mental health grounds proposed were too wide and there is a need for proper protections for the right of conscience and that religious freedoms needed to be be defended in the legislation. He said there is no conscience clause in the bill for a doctor who must make arrangements to transfer a woman to a colleague willing to provide a termination. He made his comments ahead of his speech to a Pro-Life campaign event in Dublin this evening.